Everyone loves sports and there’s a large number of people for whom basketball is their sport of preference. It may be populated by 7ft tall superstars capable of incredible athletic feats, but you could be the next big Basketball Star if you decide to load up this brand new slot from Microgaming this autumn. Broken down into the basic elements, this is a 243-ways to win 5×3 reel slot which can be played for as little as 0.50 per spin, although higher rollers can elect to play for considerably more per spin if they wish to do so. Many people will certainly want to do so given that you can win a staggering 120,000 coins on the slot if you hit lucky. 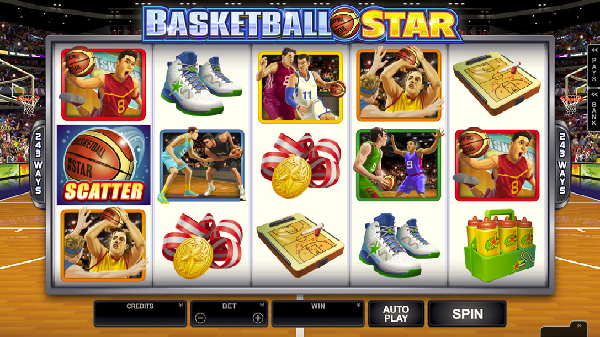 Obviously, the basketball theme ensures that the reels are packed full of basketball symbols and it is nice to see another sporting themed slot that does away with the playing card lows. Where Basketball Slot really excels however is when it comes to features. The base game has two such notable features, the Wild Shot feature being the first. The Wild Shot is triggered randomly throughout the base game and turns up to two of the reels completely wild, ensuring also that players will receive a win on that spin. The other base game feature, which is also active in the Wild Shot feature is the popular Rolling Reels bonus. Here, winning paylines explode and are replaced with symbols which roll down from above, potentially creating a number of new winning lines. The Basketball scatter symbol is the key to entering the Spins section of the slot. Here, Rolling Reels is still in operation as three, four or five of the scatter symbols across the reels sees 15, 20 or 25 spins awarded depending on the number of scatters landed. There’s also a multiplier trail in operation here which can see your total win increased from 1x the amount to up to 10x the total win for truly huge wins. With such a fun, simple and enjoyable base game and an excellent spins feature, all packed with Rolling Reels, it is easy to see why Basketball Star will be the hot slot to play this autumn.